This colourful series draws its inspiration from the Hawaiian culture, with a pretty mixture of vintage hand painted flowers, palms, fruits and shells. Add a touch of happiness and sunshine to your wardrobe! Metal is burnished gold plate. Vintage design bracelet features a cream/brown gauze ribbon which weaves through a burnished gold link chain (9mm wide). 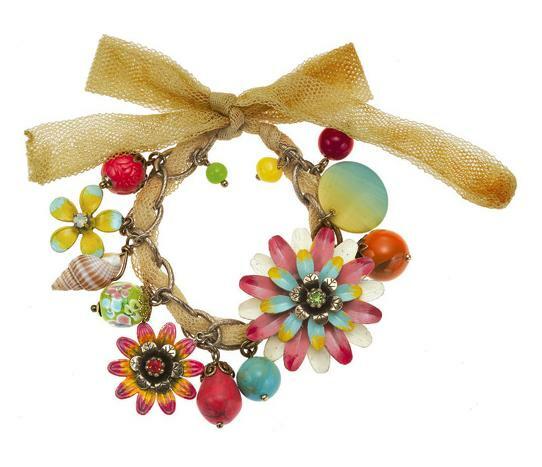 A pretty collection of hand painted flowers set with Swarovski crystals and various charms (a shell, glass floral and plain coloured beads in shades of pink, cream, blue, yellow, turquoise, red and orange). Beads/charms measure 5mm up to 4cm/40mm. Adjustable length 19cm/7.5 inches to 23cm/9 inches. The total length of the ribbon is 56 cm/22 inches which allows you to tie a generous bow. 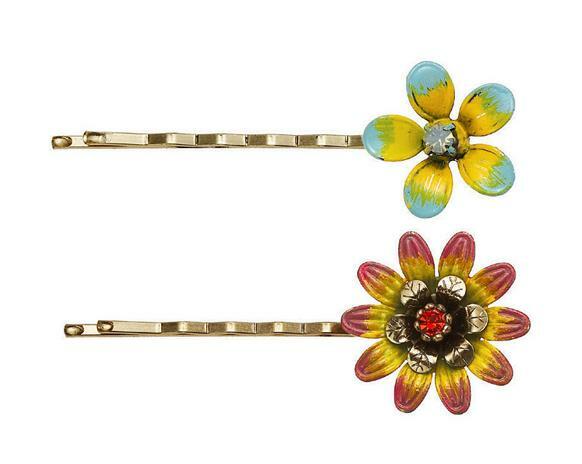 2 x pretty ‘bobby pins’. 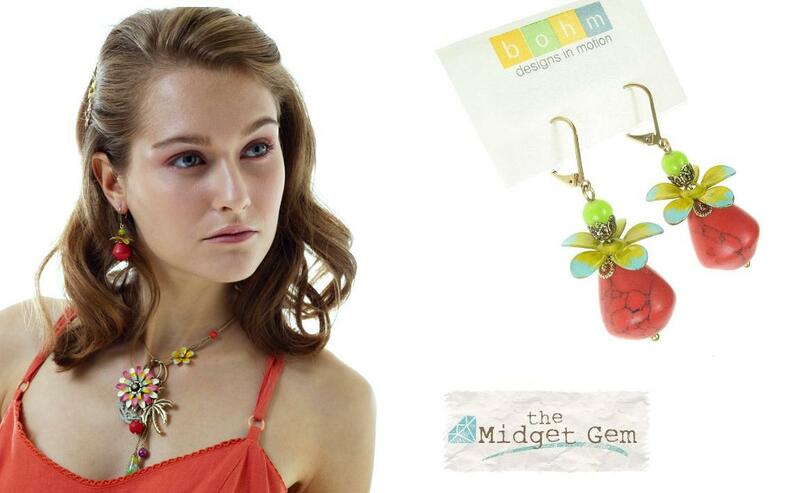 Hand painted floral decorations in yellow, blue and pink with Swarovski crystal centres in red and milky opal. 5.5cm/55mm/2.25 inches in length. Flowers measure 2cm/20mm. 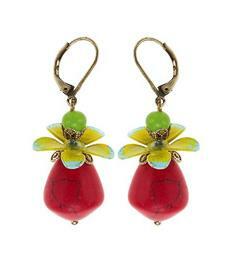 Earrings feature: green glass ball bead (5mm); yellow/blue enamelled flower (2cm/20mm); red fruity marbled drops. French clip fastener for pierced ears. 5cm/2 inches in total length. 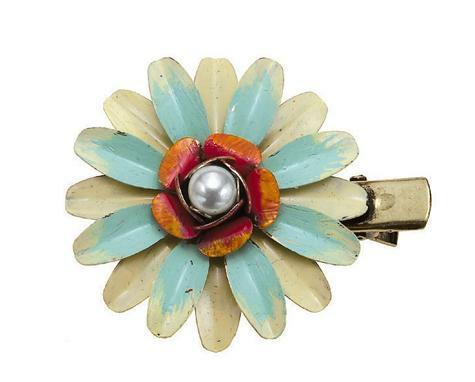 A pretty sprung clip with large hand painted floral decoration in pink, yellow, cream and blue (4cm/1.5 inches) with pearl centre. 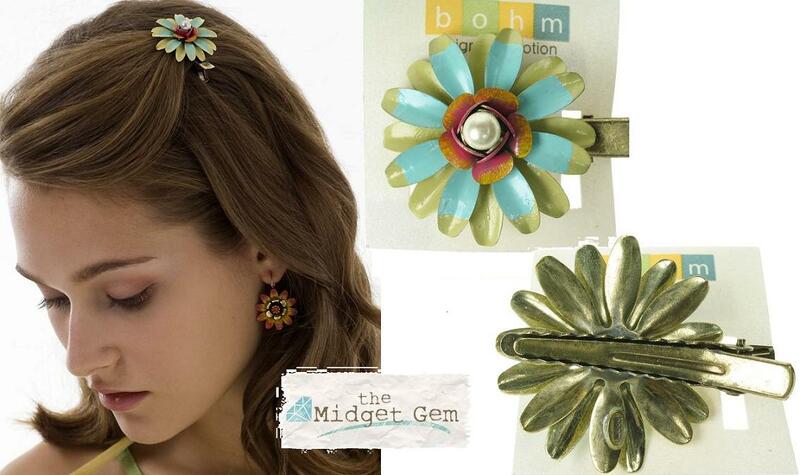 The clip is 4cm/1.5 inches in length. 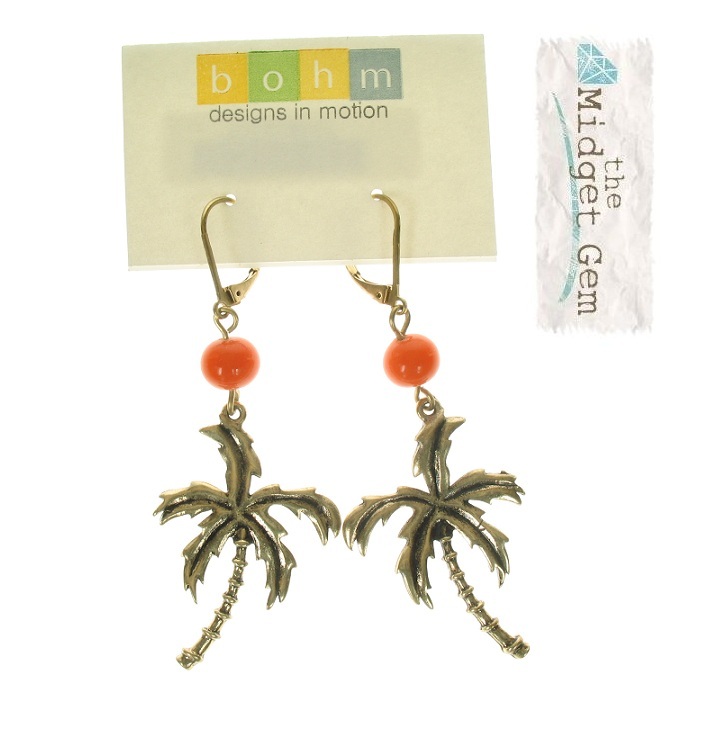 Tropical palm tree earrings, with an orange accent bead. The tree measures 3.5cm/35mm. Total earring length 6.5cm/65mm. French clip fastener for pierced ears.